I'll be in London, signing at Forbidden Planet's London Megastore next Saturday the 8th December, between 1 and 2pm. (That's at 179 Shaftesbury Avenue, London WC2H 8JR.) It's been arranged by Tor for the UK launch of "The Family Trade", and FP note on their website that if you want to pre-order a signed copy you need to do so before noon on Friday. And in other news, I get book covers. That little gem is the cover of the Czech edition of "The Family Trade" (see the British edition and US edition for comparison). NB: I didn't embed that image directly because I suspect some of you read my blog at work and your co-workers might want to know what the screams were about — I hear some Czech bookshops are apparently mis-shelving it under "romance", and I can only imagine what the readers will think when they get to the end of book #2. (Hint: the love interest's fate is not appealing.) What were they thinking? It's interesting how the US version of that series tends to have at least one gun on the cover of each book. I hate to admit it, but I think that's part of why I like the US covers best. I guess the publisher definitely knows something about Americans. Here's a naieve question- is it possible to get it into a contract that the author has final say on cover art? I've got some stonkingly bad cover art at home. One of my favourites is Thomas Disch's "334". It has a strange space ship somewhere outside a galaxy on the front. The topic on the inside has nothing to do with spaceships. Guthrie: only with a small press. With any of the big publishers? Forget it, unless you're name's J. K. Rowling -- they're running 60-300 books a year through production, and they simply can't afford the time it would take to make a one-off exception. @2 David: Perhaps the cover of the American MMPB version is cropped, or the reduced scale is playing tricks on my eyes, but I don't spot a gun or any firearm on the cover of The Hidden Family. What am I missing? Do you perceive any common stylistic differences between British and American cover-art? I always think that British cover-art tends towards the more abstract whereas American book covers tend to be more literal. Keith, the abstract/literalist cover art split is genuine, but it seems to oscillate over time. Right now, the US seems to be moving towards a more abstract style (albeit outbreaks of CGI-mediated hyperrealism in places) while the UK .. the UK seems to be more realist than usual, albeit with a lot of graphic design influenced stuff. The real issue is that American graphic design and layout is drastically different from British (or European) design; different paper sizes, different typefaces, different layout traditions. Comparing an American magazine stand with a British one is a real eye-opener. Rodinny Podnik sounds to me like it should be a battleship. Which doesn't have anything to do with the subject at hand, I'll freely admit. Duly warning, my shriek of laughter at seeing the Czech cover was modulated by the hand in front of mouth. That's special that is. @7: Darn it Charlie, now everyone will know why I purchased that one in hardback. @7: Coincidentally, two of the three M14-toting guys on that cover (the ones wearing coalscuttle helmets) are exactly like the Templars in Assassin's Creed. Not that I have time to play lengthy, open-ended video games, mind you. I do apologise, you crazy gun nut. And also, the Templars in Assassin's Creed carry no guns (I meant to say), but they do all have an amusing line in Hochsprache. I definitely prefer the American version of Halting State. OTOH for Singularity Sky/Iron Sunrise, I prefer the UK versions a lot. By a huge margin. Although it's not as clear-cut as with the Pratchetts. The us-covers are atrocious, the UK ones are works of art. I LoLed at the Czech cover - the combination of the Fantasy Romance look with the name "Charles Stross" just looks like a gag. The amulet on the American cover, on the other hand, has a disquieting vaguely gynecological look to it. 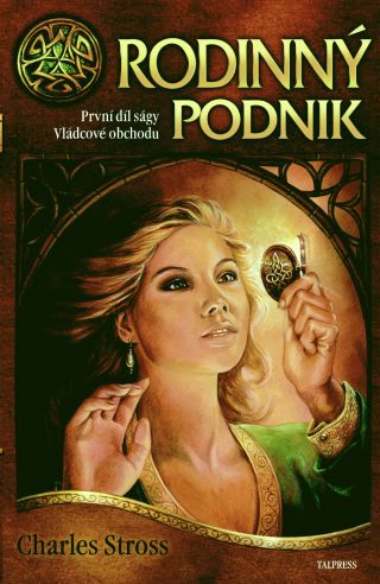 The problem with the Czech cover isn't just the girl, her hand/arm are in the wrong position, at the wrong angle. The girl has a magical cat, right? The Czech cover reminds me of fantasy novel covers (usually paperbacks) from 10 or 15 years ago. I'm not sure if I'd say that overall US or UK covers were better. For me it really depends on each individual cover. Sometimes the UK is better, sometimes the US is better. Charlie, is your appearance this weekend pure RSI-inducing signing, or are you doing any kind of reading? You seem like the exact right person to answer this teacher's bleg. Charlie, it's really hard to fire a SAW from a standing position. So the error is compounded. See you Saturday hopefully, which means from my point of view you will have jumped from online to in print to real life (as it was your posts at ML that first made me check out your fiction). I hope it's not inappropriate to say "hi" here first. I'm actually passing through London that day. Usually I find out about signings too late to go. If I make it I'll try and avoid referring to the series as a trilogy as I guess you've had enough aggravation this week. Plus I notice book four arrives in their warehouse on Saturday. So much for my prepared "witty" line. By the way, Charlie, Sheba's brother's book "Soon I Will Be Invincible" (a roman-a-clef lurks within, apparently) had an OK cover Stateside, but the UK cover is bloody wonderful. Had the publishers wit enough to use the UK cover worldwide, the thing might be a bestseller by now. there may be an issue with Forbidden Planet despatch dept. I ordered 3 of your signed books mid week, and they have already been delivered. Have they shipped too early? Question: Did you really (as per wiki) come up with the Githyanki/Githzerai? 'cos that's pretty cool. Hope you get(/got) back to Edinburgh's clear skies ok! Russ: yep, I came up with those AD&D monsters in the late seventies (originally in White Dwarf, back before Games Workshop were taken over by the Spikey Space Wombles brigade), in my teens. Some of my first published work. We're not worthy! I still have my old Fiend Folio lying around (who knows...it went out of print, maybe one day it'll be worth something). Did you ever play a Bioware game called Planescape: Torment on the PC? It had a Githyanki (or maybe -zerai) character in it, and is still one of the best PC games I ever played. It boggles the mind. "Hey, you know that guy that royally screwed the pooch and created a huge public relations fiasco? Oh yeah, let's put him in charge again." Russ: if it's a PC game, I never played it. Reason: I Don't Do Windows. Pity; yes it was only ever released on the PC. Not such a bad cover at all. It might help pick up more female readers. As for the writer's having a say (or not) regarding the cover art: you can put any cover you want on a digi book. So, if you re-gain full rights to a book that goes out of print (NEVER! ), then you can find some poor artist and have them design and create the cover you want. You could even employ an artist to illustrate some of your shorts, or anything else you make available for free. Have a contest to illustrate something and post the one you pick. Illustrators and writers can help each other out.